As we mentioned in our month end post last week, based on reports from GEB readers, we suspected that Google had released some new imagery since the November 19th update. This has now been confirmed, as Google have updated their map to show an update on November 25th. 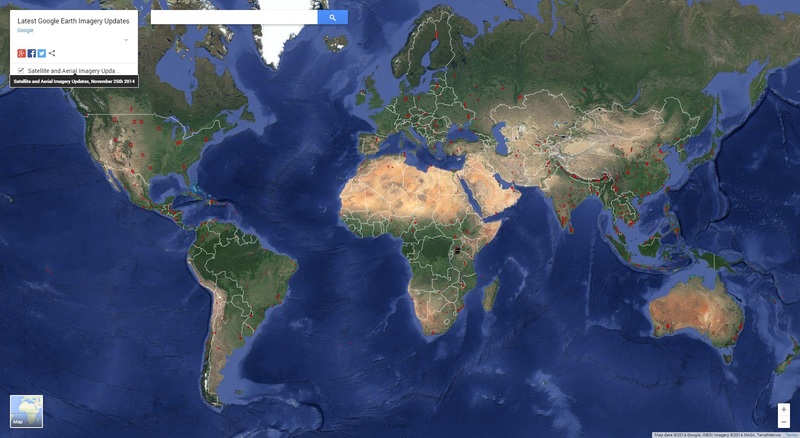 Latest Google Earth Imagery map – November 25th, 2014. Larger version. Thank you to GEB reader Chris for letting us know that Google have now published a map in the Maps Gallery showing the locations of the automatically generated 3D imagery. The map is dynamic so you have to zoom in to an area to see all the locations there. It maps cities and towns within the coverage areas rather than showing the actual outlines of the areas. We have compared it to our own map created and maintained with the help of GEB readers. We show the actual outlines, so as a result we have a number of areas that do not include large towns or cities and which Google’s version of the map does not include. There are also some recently added locations that are not yet – as of this writing – on Google’s Map, such as Dresden, Germany. We did find several locations that Google’s map has that we did not. Some are locations we had missed and will be adding shortly. Two, however, Eskilstuna, Sweden, and Melbourne, Australia, do not currently have 3D imagery, but there are signs that they may do so in future. 3D imagery locations. Larger version. I’ve noticed that although there are several 3D cities in South America (ex. Rio De Janeiro), they are not represented on Google’s map. The map shows 3D imagery is available in Green Bay, Wisconsin. It is not. Not anymore. It was fixed the next time I looked. Some of the distinction between “previously published” and “newly published” coverage doesn’t agree with my recollection of the order in which it actually appeared on the map in the Great Lakes region. For instance, it shows Manitowoc, Sheboygan and Battle Creek as newly published, and Appleton, Fond du Lac, Lansing, Kalamazoo and Traverse City as previously published. I noticed the Manitowoc, Sheboygan and Fond du Lac at the same time, several months before Appleton went 3D, and Battle Creek and Kalamazoo also were simultaneous, and before Lansing or Traverse City. Oshkosh has been 3D for several months now, and still doesn’t show up on the new imagery map. There are still some glaring non 3D cities in the region. In Wisconsin, besides, Green Bay, Milwaukee is still waiting, in Michigan, there’s no 3D in Jackson, Ann Arbor, Saginaw and most of the Northern Detroit suburbs. The most glaring omission in the region is probably Toronto. Other significant Ontario cities that are flat include Thunder Bay, Sault Ste. Marie, most of Windsor (except for a strip along the Detroit River) and London. Why doesn’t the Google earth 3D enabled imagery give it’s date? The resolution of the 3D imagery is considerably better than the default image with 3D disabled as you can see individual elements on rooftop TV antennas. What is it approximately?